Deze nieuwe hoge specificatie appartement is bereikbaar via een lift / trappenhuis, comfortabel geschikt voor maximaal 4/6 personen en biedt uitzonderlijk ruime lichte open woon / eetkamer opening naar een groot eigen balkon met uitzicht op een prachtig panoramisch uitzicht op de Middellandse Zee, een groot zwembad en aangelegde tuinen. Het is sfeervol ingericht / uitgerust met alle nieuwe moderne meubels en bijbehorende apparatuur / apparaten (in zilveren kleur) en met een maximum aan comfort in het achterhoofd. Het biedt twee zeer ruime slaapkamers met een goede kwaliteit bedden / orthopedische matrassen en inbouwkasten, Italiaanse keuken met granieten werkblad, aparte grote familie badkamer met bad / douche en volledige airconditioning met zijn lopende kosten inbegrepen in de huurprijs. Het is echt een luxe comfortabele vakantie accommodatie dicht bij de stranden en de vele toeristische attracties: Graven van Koningen, Paphos haven, waterparken. Dit residentiële complex ligt op ongeveer 10 minuten rijden van de haven met de bars en het nachtleven en er is een regelmatige busdienst aan de bovenkant en het einde van de weg of taxi's als u geen auto heeft. Er is een leuke restaurant / bar genaamd Pambi's die een geweldig menu heeft voor alle budgetten, ongeveer 7 minuten lopen. Er zijn een paar supermarkten op loopafstand. Badkamer: grote familie badkamer met bad / douche. Buiten: Groot privébalkon met tafel en stoelen voor 6 personen en 2 ligbedden. Uitzonderlijk groot zwembad met douches, wc-faciliteiten, kleedkamers voor mannen en vrouwen. Goed aangelegde tuinen met veel bankjes, lichten / bloemen, planten en struiken. Bijkeuken: Wasmachine. Schoonmaak / Handdoeken / Linnen / Schoonmaakservice: Linnen / handdoeken worden verstrekt. andere: Eigen privé toegewezen parkeerplaats. Linnen / handdoeken worden verstrekt. Uitzonderlijk groot zwembad met douches, wc-faciliteiten, kleedkamers voor mannen en vrouwen. Firstly this is advertised as Luxury this is not the true,very basic the kitchen was ok and functional ,Only 2 small saucepans of poor quality frying pan again poor quality lack of utensils ,and that was it !! no other pots and pans ,got in touch with Mitra to ask if it was possible to arrange for a cooking pot for the oven as we like to cook a main meal too enjoy on the balcony at the end of the day , we also asked for 2 more pillows as there were only 2 there again very poor and dirty these pillows should be thrown away would not let my dog sleep on them ,her response Was for us too go out and buy a cheap cooking pot ourselves,but would arrange for new pillows which never arrived,hence we bought our own, the beds had no mattress protecteds on them the bed sheets were disgusting clean but very old and worn with holes ,and only 1 set so had to wash and dry them the same day to put back on , would have liked a second set as our stay was for 3 weeks,the towels again very well used.TV not working along with the DVD player. Spent 11 nights in this apartment it was clean and tidy and served its purpose well there was a few maintenance issues which I e mailed Mitra the owner to inform of and she was aware of some of them but said that they will be addressed but they did not impact on our stay. The complex is nice and well laid out the apartment was big enough for my partner to get around in the wheelchair the lift worked perfectly and in our case was essential. Local shops and pubs/restaurant's etc aren't to close by so be prepared for a 10/15 min walk if you have no car. The pool area is very nice the balcony over looked it we never used it preferring to use the balcony for any sun worshiping times that we had. Never used the Air con but all other items i.e. the cooker washing machine all worked. Would I return yes but would probably hire a car next time. First of all want to thank Mitra for her help in our first half of the rest! We had big problems with apartment and Mitra helped us with our two little children! We had very lovely apartment, located in the superior quiet and relaxing Diana Gardens complex, with clean swimming pool, sunbeds. Our two bedroom apartment was accessible by lift, had everything you could possibly need for pleasant stay. Comfortable beds, marvelous patio, well equipped kitchen, plentiful wardrobe space, washing machine, microwave, private parking place, nice interior, air con, such to say everything for feeling like home. I would definitely recommend this apartment! Thanks a lot to Mitra! Good luck! On arrival the person managing the apartment was not aware that we were due so the keys were not there and we had to wait for him to come and let us in. Because of this the apartment hadn't been cleaned so we had to do this ourselves. Some items were broken and the kitchen was not very well equipped for cooking although there were plenty of plates, knives and forks. The charging of the Deposit is via OwnersDirect and nothing to do with the Owner. The Owner just specifies the amount of Deposit. OwnersDirect asks for the Deposit and even keep the Deposit in their account& refund to the Client themselves, provided there is no damage/breakage etc. In this case, the FULL deposit was refunded by to the Client by OwnersDirect. I appreciate the fact the Management person on this occasion forgot the date of Client's arrival, though I had messaged him. His wife is very ill with Cancer and on this very occasion he must have forgotten. But as soon as the Client contacted me, I reached the person and the key was provided immediately. Understandably, I did not charge any cleaning charges and the FULL refund of Deposit was given. It is the 1st time, a client is not happy with the kitchen equipment etc & I have had many many clients over the years: all the items mentioned in my advert are in the kitchen and working. So may the client clarify exactly what was missing or not working. He never contacted me regarding these issues other than the key issue. An unfair & unjust review. Over the years, I have had many clients (much over 200 guests) and having no complaint and 100% response, should speak for itself. 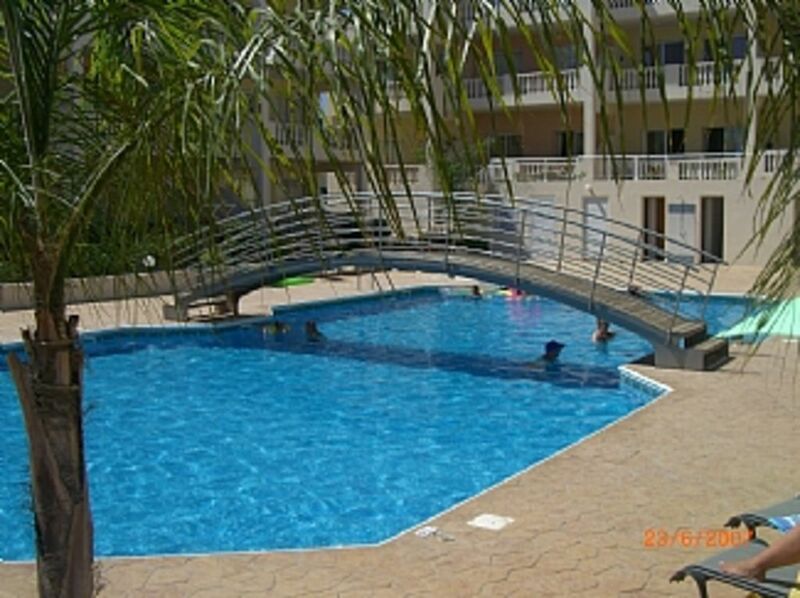 This is a large, very well appointed apartment with a large balcony overlooking a lovely clean pool. It is a small complex, privately owned with some expats permanently living there. There is a lift as the apartment is on the second floor. The whole complex is spotless, and away from noise of the town. It's about 10 minutes drive from the harbour with the bars and nightlife and there is a regular bus service or taxis if you don't have a car. There is a nice restaurant/bar called Pambi's which has a great menu to suit all budgets, about 10 minutes walk. There are a couple of small supermarkets within walking distance. Great communication from the owners. Highly recommended. Booking Notes: £200 deposit at time of booking which is returnable within 14 days of return provided there is no damage or loss. Long term rental will be considered. Please contact 07957 - 293 321 or email mitratahm@yahoo.co.uk for further information. Late Departure: There would be 3/4 of the daily rate if Guests are to stay past 11am on day of departure. If more than 4 guests, there would be an addition charge of £50 per week per extra person.